Ettayapuram is the birth place of the revolutionary poet Subramaniya Bharathiyar and is located 76 kms from Tirunelveli and 22 kms from Kovilpatti and 35 kms from Thoothukkdi. His home now became a monument. Umarupulavar Dhansha is also located here. Kazhugumalai Jain Temple is 60Km from Tirunelveli and 21Km from Kovilpatti. This is basically a Jain temple where we can see images of Adinatha, Neminatha Mahaveera Parvanatha, Bahubali . There is also a monolithic Temple called Vettuvan Kovil. This is the only one of the monolithic Pandya Temple that still survive. Thoothukudi is traditionally known for pearl fishing and shipping activities, production of salt and other related business. This is a port city in the southern region of Tamilnadu. This is a natural port, from this place freedom fighter V.O.Chidambaranar operated the Swadeshi shipping company during the British rule. 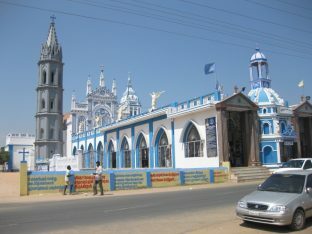 Now Thoothukudi is a bustling town with business activities. Adichanallur is 20km from Tirunelveli on the way to Tiruchendur. From an Archaeological point of view, this place has a glorious past and it is located on the banks of river Tamirabarani. It is assumed that, in ancient times a civilized habitation flourished here. 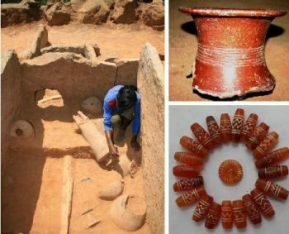 Urns (burnt-clay vessels which were used for burying dead bodies of the very old people) small mud vessel were found near the river Tamirabarani and they are supportive evidence, for the civilization. 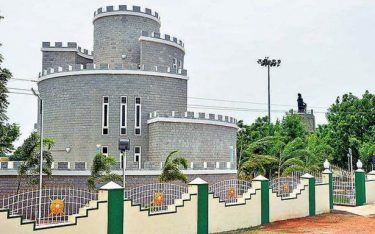 This place is now under the supervision of Tamilnadu State Archaeological Department. Kayalpattinam was a famous port next to Korkai in the 12th and 13th Centuries, situated 30 kms from Thoothukudi and 18 kms fromTiruchendur between Thoothukudi and Tiruchendur highway. It has a fine beach on Bay of Bengal. Kayathar, is situated about 25 kms from Tirunelveli on the way to Madurai. Kattabomman, one of the earliest Freedom fighters of who fought against the British rule in India, was hanged by the British in1799 at this place. A memorial has been built here by the Tamilnadu government to commemorate the memory of this great freedom fighter. Korkai ancient port city of Pandian dynasty in the Sagam period is located on the main road from Tiruchendur to thoothukudi . It is 29km from Tiruchendur . The Tank of Korkai is said to be korkai kulam with a extent 250 acres. 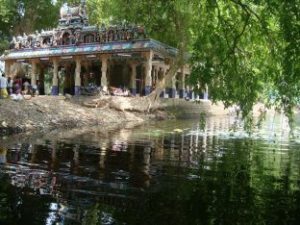 An ancient Vettrivelamman Temple is also situated here. Many a number of tourists visit this temple. Manapadu is a Coastal village situated at 70 kms from Tirunelveli and 18 kms from south of Tiruchendur. This place was visited by St. Francis Xavier in 1542. The Holy Cross church built on a cliff attracts thousands of pilgrims throughout the year and during the month of festival (1st September to 14th September) thousand numbers of tourists assembles here. 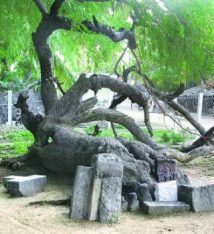 It is 13km from Tiruchendur and said to be an ancient village. 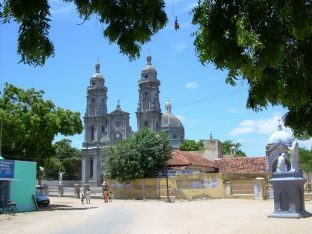 The Pari Pauvlin Church here was built in 1847. It is 110 feet long, 55 feet wide with steeple in the front soaring into the sky a height of 192 feet. 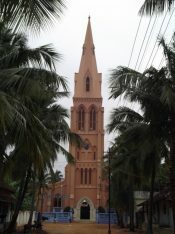 This is one of the biggest churches with the tallest steeple in India. It is 45km from Tirunelveli. Presiding deity of the temple is Pabavinasar alias Kailasanatha and Mother goddess is Ulagammai A good picnic spot a large number of tourists. Agasthiar water falls is 2 kms from here. It is 22km from Tirunelveli and is located on the bank of river Tamirabarani. presiding deity of the temple is Sri Ammainathar alias Kailasanathar and Goddess Avudinayaki. Frequest city buses available from Tiruenlveli Junction. It is 15km from Tirunelveli on the way to Cheranmahadevi and the temple is located near Nadukallur village. Presiding deity is Kailasanathar and Goddess Sivakamiammai . City buses available from Tirunelveli Junction Bus stand. It is 2km from Tirunelveli Town railway station. And also very near to Thiruvengadanathapuram Kunnathaur is located in small hillock. Presiding deity is Kothai Parameswaran. Goddess Sivakamasundari. It is 17km from Tirunelveli and 40km from Thoothukudi on the National Highways. It is also situated on the banks of river Tamirabarni. Presiding deity is Kailasanathar Goddess Sivakamiammal. It is 30km from Tirnelveli and 40km from Thoothukudi it is also located on the river Tamirabarni. Presiding deity is Kailasanathar Goddess Sivakamiammai. 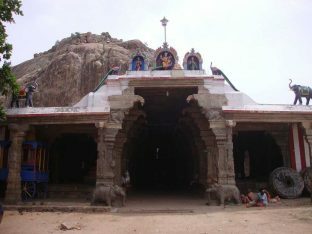 The first Navathirupathi temple is located here. It is 38km from Tirunelveli on the way to Tiruchendur. Presiding deity is Kailasanathar .Goddess Allakiyaponamal One of the Navathrupathi temple also located here. It is 38km from Tirunelveli on the way to Tiruchendur near Thenthirupperai. Presiding deity is Kailasanathar Goddess Alagiya ponnamal and Sivakamiammai. It is 20km km from Thoothukudi on the way to Tiruchendur near Athoor and Ponnakayal. Presiding deity is Kailasanathar Goddess Sivakami Ammai. City bus available from Thoothukudi Old bus stand. The nine Vishnu Temples are located very close to one another. They are all in Thoothukudi District. The Vaishnava shrines are having an interesting legend. The shrines are notable for nine stone carvings and temple architecture. Panchalankurichi is a small historic village located 25km from Thoothukudi and 55 km from Tirunelveli. From here the Great warrior Kattabomman popularly known as “ Veerapandiya Kattabomman” raised his voice against the British regime in the 17th century AD. 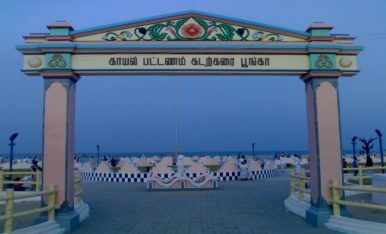 The existing Memorial Fort was constructed in 1974, by the government of Tamilnadu. The Memorial hall, has beautiful paintings depicts the heroic deeds of the saga which give a good idea about the history of the period. Sri Devi Jakkammal Temple, the hereditary Goddess of Kattabomman, is located in the fort complex. Cemetery of British soldiers can also be seen near the fort. The rest of the old fort is protected by the Department of Archaeology. City bus services available from Thoothukudi. 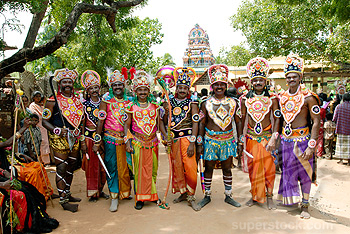 Kattabomman Festival is celebrated on January 15 and May second week every year which attract thousands of people. Small bullock cart race is the special attraction during festival. Tourist can visit the fort from 8.A.M to 1 P.M. and 2 P.M. to 6 P.M on all days. The entrance fee for adult Rs.2 and Child Rs.1. A Tourist Rest house is available here for the benefit of the Tourists. Thiruchendur is one of the major pilgrim centres of South India. This Temple is situated at a distance of 40 kms from Thoothukkudi. The sea-shore temple is dedicated to Lord Muruga, is one of the six abodes of Lord Muruga. (Arupadi Veedu).The nine storied tier temple tower of height 157 feet belongs 17th century AD. Visiting Valli Cave, taking sea-bath, and bathing in Nazhikkinaru are treated as holy one. It is well connected by bus service to all over Tamilnadu and train services to Tirunelveli and Chennai.